Simple XML are functions that are part of PHP that allows users to easily manipulate/use XML data. Simple XML is a great way to either render XML or consume it, using the built in extension with PHP a developer can begin working with XML in a matter of minutes. How do I know if I have Simple XML installed? On some hosting packages Simple XML may not be installed/compiled with your version of PHP. As of PHP version 5 Simple XML is core functionality, but if you are unsure there are a few ways you can find out whether you have Simple XML. WAMP server includes the latest version of PHP as standard, WAMP users should be able to work with Simple XML without any need for additional configuration. su – – root to ensure you have a user with elevated permissions. Depending on your distro you may ;/need to add additional repos to get the correct version of PHP-XML, for example when working with CentOs you may need to add the latest EPEL repo to your distro. Once you have installed the extension, you will need to restart the Apache HTTP Daemon, you can achieve this by running:service httpd restartThis may be different on your distro, generally the format of the call is the same. Example 1 – Using PHP to render data from RSS feeds. We will be using BBC’s RSS feed http://feeds.bbci.co.uk/news/rss.xml” in our example. Create a file called simplexml.php and add this snippet . What this does is displays the different nodes/data in the xml file provided. Now we can tap into anything in this file and render what we want by doing some basic PHP. Copy and paste the snippet below. Congratulations we have now used simple xml successfully. 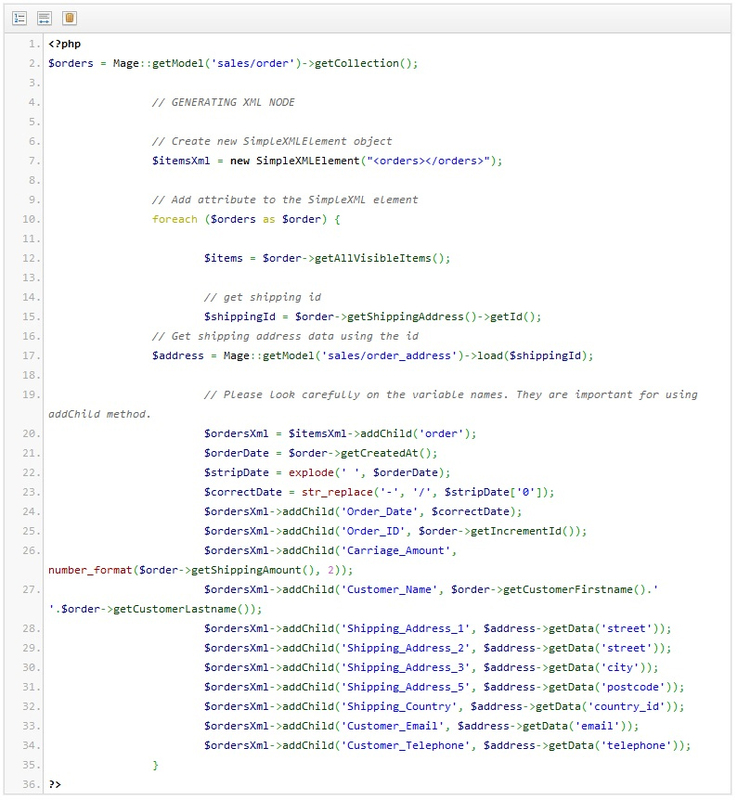 Below is an example of a XML order feed for an ecommerce website, the requirement for this functionality was that each order was wrapped in well-formed XML to allow a stock system to received order updates. This XML feed for specifically created for Magento, the same format could be used for any system. Using this working example will help you to better understand how we work with XML.